Indian weddings have one primary goal: to create a memorable experience by focusing on as much opulence as possible. 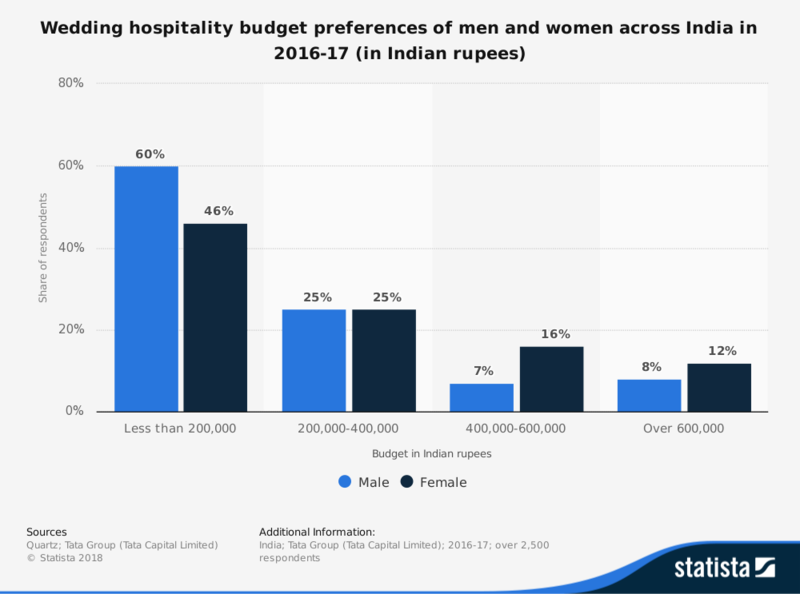 That creates an opportunity in India, the UK, and in other locations around the world to celebrate Indian weddings through a supportive industry. Although Indian weddings have started to become more modern with their look and structure, there is still opulence to be found. Couples might opt to spend less on dresses or jewelry and more on a trip to an exotic location for their honeymoon – assuming that they aren’t having a destination wedding in the first place. 99% of couples who decide to have a traditional Indian wedding will take a honeymoon. The trip is booked 4 months in advance, as an average length of 8 days, and for the Indian population living in other countries, 90% of them will register for wedding gifts. Unlike other countries, however, many Indian destination weddings are the first wedding for each person. Outside of India, 80% of the couples who have a destination wedding have been married at least once before. Because India has one of the largest population centers in the world today, it will continue to boast one of the largest wedding industries in the world as well. Over the next 10 years, as incomes rise in the country, the wedding industry may begin to close the gap between it and the United States. Even though far fewer weddings are performed in the U.S., the overall cost of the wedding itself is much higher. No amount of opulent spending in India can match the spending in the U.S. which is considered standard. In the United States, the average wedding costs $30,000 on its own without anything fancy or elegant. For a wedding in New York City, the average cost is over $76,000 – for something basic. The primary trend in Indian weddings is to modernize without disregarding the time-honored traditions. Modern dresses infused with traditional details are becoming popular. Spending has shifted from jewelry which may never be worn again to trips that everyone can enjoy for a destination wedding. Expect the trends seen around the world begin to impact India shortly. As for industry growth, it will keep pressing forward. People will still get married, and they’ll turn to this industry for help.